IBM Web Experience Factory is a powerful and flexible tool which simplifies & accelerates the development of custom portlets and applications on top of a service-oriented architecture. IBM Web Experience Factory software includes an easy-to-use graphical tool, called IBM IBM Web Experience Factory Designer, for creating, viewing, and running portlets. 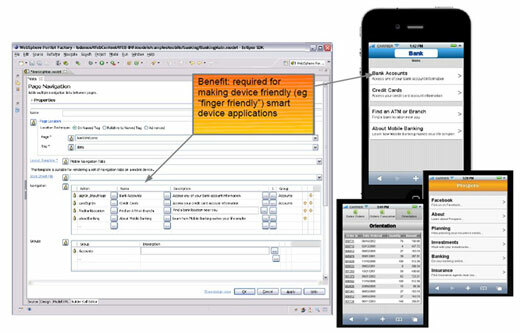 Portlets created with IBM Web Experience Factory are dynamic, robust Java™ 2 Enterprise Edition (J2EE) applications that react automatically to change. They can be further modified by business users in real time to meet changing business requirements, without requiring any coding, or duplicating and versioning of assets. By eliminating the need to code all of these implementations and their variations, IBM Web Experience Factory simplifies the development, deployment, and change management process, saving companies time and money. We help you to develop portlets and servlets as per your business requirements. The development time is reduces to 70 percent as compare to traditional portlet development. The portlets that develop using portlet factory has the following capabilities. Portlets Development are a complete application having multiple states and view modes, plus event and messaging capabilities. WebSphere Portal Gurus use best practices to architect and implement high performance and scalablePortlet applications. Using the JSR 168 portlet API or the IBM® portlet API. Selecting the markup languages, such as HTML, cHTML or WML, to use. Using JavaServer Faces (Faces) technology. Creating a portlet project and developing portlets.